Tracing its heritage back into the nineteenth century, the Santa Fe [NM] Concert Band provides a musical outlet for some excellent area musicians, including several area school band directors. Directed by Greg Heltman, the band presents concerts several times a year around the Santa Fe area. Yvonne and Norman played with the group for their 2002-03 season with Yvonne on bass trombone and Norm on oboe, but during the course of the season Yvonne also played percussion and Norm covered alto saxophone, French horn, tympani, and trombone parts as well. 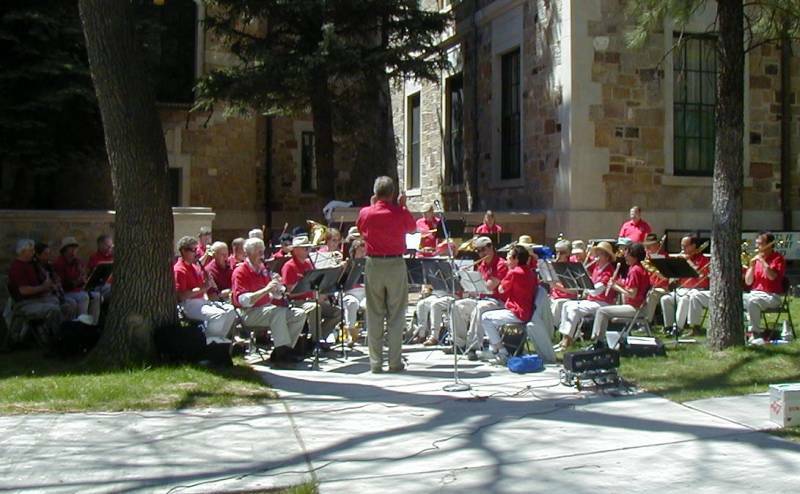 Taken at its Mothers' Day concert in Santa Fe on May 11, 2003, director-du-jour Richard Snyder leads the band with Yvonne on percussion (just to the right of Richard) and Norman on timpani (right rear).